The Faculty of Law “Iustinianus Primus” in Skopje is member of the Ss. Cyril and Methodius University, the biggest and the oldest university in Macedonia. The Ss. Cyril and Methodius University was founded in 1949 as the first university in the country. On 3 November 1951 the Government of the People’s Republic of Macedonia founded the Faculty of law and economics as a member of the Ss. Cyril and Methodius University. Later, on 1 July 1956, as a result of the increased interest of the students, the Faculty of law and economics was divided in two faculties. Since then, the Faculty of law exists as a separate institution of higher education within the Ss. Cyril and Methodius University. n its beginnings the curriculum of the Faculty of law was concentrated on the undergraduate legal studies only. In 1980 the Faculty of law opened a new department for journalism studies and in 1993 adopted the curriculum of the political science studies. In the last 55 years over 13000 students have graduated from the Faculty of law. Having in mind the continuous development of the academic programs as well as the need of the students, the Faculty of law opened the first postgraduate course in 1966. It was the LL.M. course in International Transport of Goods and Services which was later followed by the LL.M. courses in Business law, Criminal law and Criminology, Civil law, International law and International politics, Legal and political sciences and Communicology and State and Legal History of Macedonia. Over 300 candidates received their Master of Laws (LL.M.) degrees from the Faculty of law by 2006. At the same time, the Faculty of Law developed its PhD studies in the fields of law, political science and communicology. The first PhD thesis at the Faculty of law was defended in 1959. Consequently, over 100 candidates defended their PhD theses at the Faculty of law in the last 50 years. 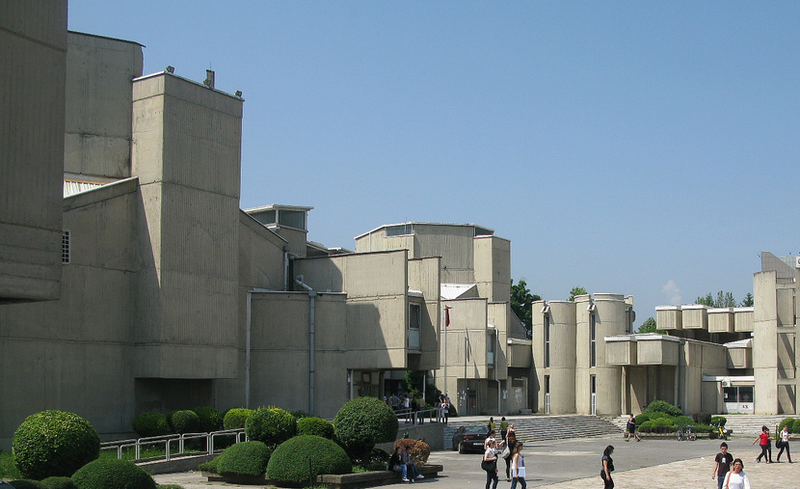 In 1994, the Scientific Council of the Faculty of law declared 10 December, the international day of human rights, as the day of the Faculty of law in Skopje. On 9 September 2001 the Scientific Council of the Faculty of law decided to name the Faculty in the honor of the Byzantine emperor Justinian I. On 1 April 2005 the Scientific Council of the Faculty of law adopted the new curriculum for undergraduate and postgraduate studies of all academic programs. The new curriculum is completely harmonized with the European Credit Transfer System and is based on three cycles of studies (undergraduate, postgraduate and doctoral) in the proportion 3+2+3. The curriculum offers three independent academic programs in law, political science and journalism. The educational process is carried out through lectures, seminars, workshops, clinics and practical work. Today the Faculty of law “Iustinianus Primus” represents the leading academic institution in the field of law, political science and journalism in Macedonia. The academic community of the faculty gathers eminent and respected professors and assistants. The Faculty has established academic cooperation with 70 faculties in the world, incorporated modern technology in its educational process and opened several research centers.